Defying sceptics who were prone to dismiss him as a shadow of Vladimir Putin, Russian President Dmitry Medvedev has emerged into his own after more than two years of helming Russia through multiple crises. May 7 marked the halfway mark of Dmitry Medvedev’s presidential term. It’s time to look back at the last two heady years that saw a protégé of the powerful Vladimir Putin coming out of the shadows and taking charge of the nation’s affairs through challenging times, evolving and perfecting his own style of leadership in the process. Two defining events within the first few months of his presidency proved to be just the crises that can be called baptism by fire. The first was the Georgia operation and the second one that tested his management prowess was the global meltdown. Since then, he has steadily tightened his hold over power and people’s imagination. On August 7, 2008 at exactly 11:35 p.m., a Georgian Army grouping began military operations against South Osetia in a bid to resolve its differences with this unrecognised republic by force. The next day, Medvedev announced that Russia would have to launch an operation of its own “to force Georgia to peace”. In the next few days, Medvedev made not one, but two important and considered decisions — to begin the military operation and to wind it up. Before the Georgian campaign, Medvedev was referred to only as a successor and “Putin’s protégé”. But by taking responsibility for the South Osetian operation, the president compelled people to speak of him for the first time as an independent politician in his own right. 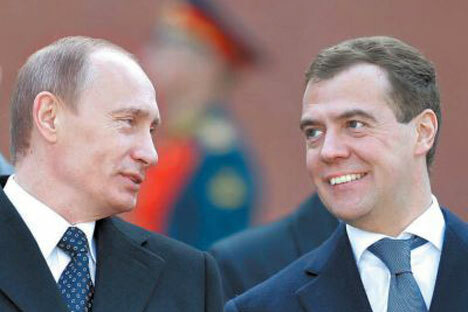 The global meltdown compelled Medvedev to put off his plan of turning Moscow into an international financial center. However, he soon rose to the challenge. The government poured hundreds of millions of roubles into the banking system and initiated a slew of reforms. Not all of it was successful, but the economy is growing, largely spurred by the high price of oil and gas. The cri sis, however, helped Medvedev to realise the vulnerability of the commodity-driven economic model and the urgent need for economic reforms. He has encouraged the Kremlin to legally protect entrepre neurs from those who are “making business a nightmare” and imposed a ban on holding those suspected of economic crimes in custody. In the fall of 2008, Medvedev unveiled his rallying slogan: “Modernizing Russia”. A year later, the president set up a commission on economic modernisation and technological development. In September 2009, he published his manifesto of modernisation in an article entitled “Forward, Russia!” in which he spoke of the need for a leap of modernisation. The once taboo expressions such as “humiliating dependence on raw materials”, “ineffective economy”, “weak democracy”, “centuries-old economic backwardness”, and “centuries-old corruption" acquired a new legitimacy. Russians are now watching closely his pledge to create an innovation center in Skolkovo outside Moscow. In his presidency, the collective age of governors in the Federation Council has come down by 230 years. In his forties, the twitter-loving president has injected a new vigour into his administration by recruiting younger appartchiks and has spawned a new culture of transparency by talking to the Internet generation in its own language without interpreters, earning him plaudits in the national television networks. His blog in LiveJournal has become a book of complaints and suggestions from around the country. After the outcry in response to the mass falsifications in regional elections last fall, the elections this spring were, as even members of the opposition had to admit, much cleaner. Local bosses did not, of course, stop trying to ingratiate themselves with the ruling United Russia, but they did this far less aggressively and recklessly than before. Medvedev is trying to pull the sluggish bureaucratic machine into the digital future, but the resistance is still great. Recently, he took Nizhny Novgorod governor Dmitry Shantsev publicly to task for not knowing how the regional government services site works. The violence-engulfed North Caucasus, a source of terrorism for all of Russia, is one of the most dramatic consequences of the collapse of the Soviet Union. By replacing Federal Security Service (FSB) General Murat Zyazikov as president of Ingushetia with Yunus-Bek Yevkurov, Medvedev made it clear that the emphases in policy in the North Caucasus are changing. Zyazikov gambled on repressions. Yevkurov has not abandoned the use of force, but he strives to achieve compromise. In early 2010, Medvedev decided to redraw the administrative map of Russia by adding an eighth federal district — the North Caucasus — to the seven existing ones. He appointed as his special envoy to that district not a politician from the security or military services, but a successful governor with experience in big business, Alexander Khloponin, whom he also made a deputy prime minister. Thus the federal authorities have staked their claim on a program of “loyalty in exchange for prosperity”: Khloponin’s job is to bring new investors to the region. Meanwhile, the fight against underground bandits goes on. What’s more, Medvedev has said that bandits must be tracked down “across the board”. A new era in Russian-US relations began with a linguistic twist. U.S. Secretary of State Hillary Clinton gave Russian Foreign Minister Sergei Lavrov a present — a large, red button to symbolise the resetting of relations. “We spent a long time choosing the right Russian word. What you do think, did we?” said Clinton. Unfortunately, Lavrov had to say, “No.” The button’s Russian-language label read not PereZAgruzka (Reset) but Peregruzka (Overload). Despite this amusing incident, the reset did occur. Witness the ease with which the US is lessening its involvement in events in post-Soviet space and in Eastern Europe. Washington’s actions suggest that it recognises Russia’s right to its own sphere of influence and interests. In Ukraine and in Kyrgyzstan, the ones out of power are ones who brought the “color” revolutions. The US has decided against placing its missiles in Poland and the Czech Republic, while the dialogue concerning the installation of an American ABM system in Europe continues. A new agreement to limit strategic weapons was recently signed. President Medvedev’s international successes can objectively be viewed as an asset for Russian foreign policy. Medvedev has tried hard to rid the establishment of corruption and inefficiency. He has sacked errant officials in Ministry of Internal Affairs, the Federal Punishment Service and the Fire Services. He did not hesitate in chastening the powerful. When Major Denis Yevsyukov, head of the Tsaritsyno district precinct in Southern Moscow, shot his driver and then created a bloodbath in a local supermarket, killing one person he took prompt action and announced radical reforms in the Interior Ministry, seen as a hub of bribes, blackmail, torture, prostitution and rackets. Not just anyone could fire 17 generals with the stroke of a pen. The president did this on February 18 this year. At the same time, he said the numbers of staff within the ministry’s central apparatus would be cut by half and that the overall police staff would be cut by 20 pc. However, Medvedev’s biggest failure has been his unsuccessful battle with corruption. According to Supreme Court statistics, of 2,300 takers of bribes of over a million roubles ($35,000), only 35 were sent to prison in 2009. Meanwhile, the corruption in Russia is constantly growing and is estimated by experts to be some $300 bn a year. (State budget revenues in 2009 totaled $250 bn!) Two months after assuming office, President Medvedev announced a National Plan against Corruption. On April 14 this year, he signed a document entitled ‘National Strategy to Counteract Corruption.’ All senior officials are now required to publicly declare their income. However, the battle against corruption is set to be a long and hard one with a network of vested interests thriving in league with a section of the establishment. A photography buff since his youth, Medvedev recently returned to his hobby, but it appears presidential duties are coming in the way. “Given my work, it would look strange if I were to leap out with a camera and start photographing someone. I’m afraid people wouldn’t understand,” said the president. This photograph by Medvedev of the Tobolsk Kremlin was sold at a charity auction for 51 mn roubles ($1.7 mn). Two years on, Dmitry Medvedev is no longer merely a successor to Vladimir Putin, but a self-sufficient president. A woman of many parts, First Lady Svetlana Medvedev is a Russian Orthodox blogger, a stylish dresser and a patron of the arts and high fashion. Since moving to Moscow, she has befriended many people in the arts and show business. She is also up on the latest fashions in technology. Like her husband, she has her own blog where she reports on her travels and charity projects. But at the same time Mrs Medevedev is a devout women, who spends a lot of time raising her son Ilya.